In a half-constructed lot in Fulton, Maryland, behind a nondescript strip mall, sits a unique startup development firm with a team comprising former intelligence officers, hackers and tech industry insiders. The brainchild of SEAL Team 6 alumnus Mike Janke, CIA officer-turned-entrepreneur Steven Witt and Silicon Valley money man Bob Ackerman, DataTribe is in the business of turning one-time spies into successful startup founders. Unassuming in name alone, DataTribe quietly oversees an investment fund of approximately $35 million, which it uses to guide early-stage cybersecurity companies toward an acquisition or an initial public offering. Most seed-stage-centric firms operate with much less capital than DataTribe. “We build gold-cup startups,” Janke blankly stated during an interview at the firm’s headquarters. “We make it an unfair fight” by providing portfolio companies with an ample amount of resources. The fund is fueled by a close group of business partners, including several prominent private equity investors and private sector cybersecurity executives, in addition to three corporate sponsors: Deloitte, Ackerman’s Allegis Capital and Yahoo! Japan. This braintrust of combined associates and advisers acts as a support system for portfolio companies, helping them to secure initial contracts and recruit gifted employees. In return for funding its portfolio companies, DataTribe takes an undisclosed equity stake in each. Unlike most traditional startup incubators, DataTribe’s daily operations are run by 11 full-time employees. Every member of DataTribe’s executive team boasts both intelligence community experience and multiple exits as startup executives themselves. In addition, a group of four Silicon Valley marketers and product designers travel from San Francisco to Washington, D.C., on a monthly basis to provide guidance to each portfolio company. Levy is a venture partner at Allegis Capital, an investor in DataTribe. At the moment, three cybersecurity startups are backed by DataTribe, including industrial control system cybersecurity company Dragos, commercial homomorphic encryption designer Enveil and secure hardware maker Kesala. Startups accepted to the program are given $1.5 million on average and will receive upwards of $800,000 worth of in-kind legal, marketing and consulting services. In February, after being launched just four months prior by former NSA senior researcher Ellison Anne Williams, Enveil took second at the RSA conference’s prestigious Innovation Sandbox Contest. Janke said the accomplishment is a clear testament to his firm’s investment model, which is hyper-focused on molding brilliant, former intelligence officials and government researchers into highly effective corporate executives. At its core, DataTribe is fundamentally built on a series of dynamic relationship with intelligence agencies in four of the five countires make up the Five Eyes intelligence alliance: Australia, Canada, the United Kingdom and U.S. The group leverages those relationships to attract talent capable of developing commercial security and analytics software that is essentially inspired by secretive and classified technologies. “Every night at 6 p.m. here we host about 20 to 30 people from various intel agencies and research labs, and they’ll get a pass, and they’ll come here just to work on their own ideas,” said Janke, who co-founded and previously served as CEO for mobile cybersecurity company Silent Circle. All three of the firm’s current portfolio companies boast staff from the U.S. intelligence community. 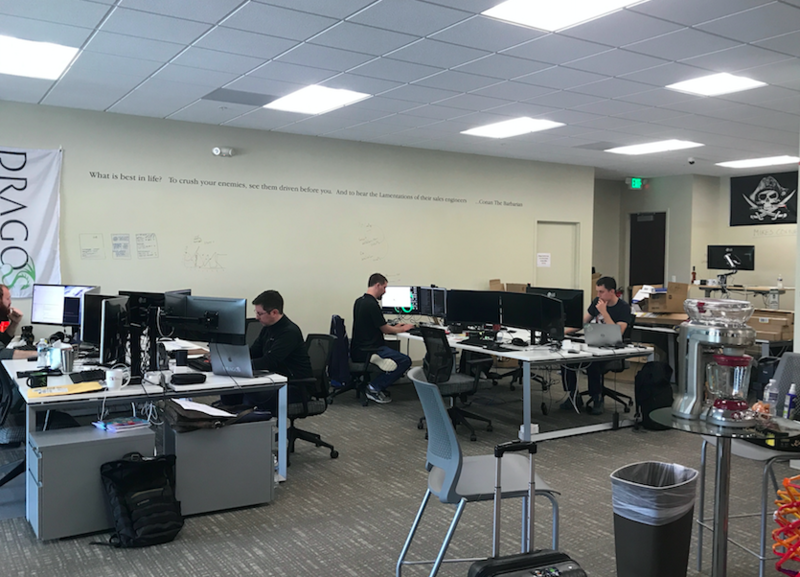 A fourth company, which DataTribe declined to name, will soon move into the Maryland office to round off the first cohort. Janke said that he and his team spent their first year operating “under the radar,” solely focused on forging collaborative partnerships with many of the world’s most powerful and technologically advanced security organizations. In practice, DataTribe’s model mirrors the structure of Israel’s vibrant cybersecurity startup ecosystem, which is heavily built on talent from Unit 8200, the Israel Defense Force’s elite signals intelligence group. Unit 8200 alums have become known over the last several years just as much for developing successful ventures as they once were for collecting intelligence. As a result, the clandestine unit’s public image has shifted in Israel with a new generation of recruits viewing their service as a potential launching pad to jump start business careers. Roughly 240 companies auditioned for funding from DataTribe over the last year alone. Next year, DataTribe plans to add four more companies its portfolio. Reports of poor retention and low morale inside the U.S. intelligence community have circulated in recent months; underlining a larger issue in government of keeping talented employees from leaving for lucrative private sector positions. Former NSA Director Keith Alexander said in December that low morale at the NSA was causing some of the agency’s most talented people to leave. Janke said DataTribe can act as a sensible middle ground for the intelligence community as leadership comes to grips with the impact of market driven forces that offer their workforce more money.